Letter to members of the Carpenters for Christmas from Oberlin Action for Civil Rights co-chairs Marcia Aronoff and Jerry Von Korff, March 5, 1965. The letter discusses the outcome of the church rebuilding project in Ripley, MS, and civil rights work that must be done beyond that. 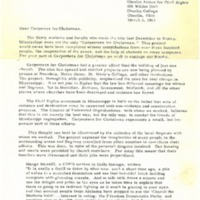 Aronoff, Marcia; Von Korff, Jerry, “Letter to Carpenters for Christmas from OACR co-chairs,” The Oberlin Sanctuary Project, accessed April 24, 2019, http://sanctuary.oberlincollegelibrary.org/items/show/103.